How to create Intelligent Mail Barcodes (IMB) in Excel? How to use the Intelligent Mail Font Package and VBA to create IMB barcodes? (2) Font Encoder The Intelligent Mail Font Encoder VBA is available in the IMB Font Package. A font encoder is a component that takes the data that will be converted to a barcode and formats it into another form of data that the barcode font can understand. The IDAutomation VBA Macros is a free font encoder that encodes data for Excel and Access. This tutorial uses Excel 2013 as an example. The tutorial assumes that IDAutomation Intelligent Mail Font Package (Demo or Sale) are downloaded and installed. 1. Navigate the Font Package to locate the VBA file named IDAutomation VBA for Intelligent Mail.bas. 2. 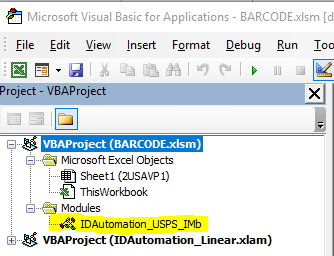 To identify the location of the IDAutomation VBA for Intelligent Mail.bas file that will be imported into Excel's Visual Basic Editor. Remember the location of the file. 3. 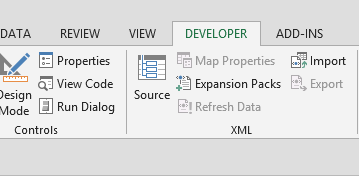 Open Excel, select the Developer Tab. 6. 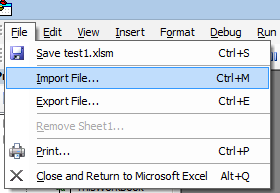 To import the VBA, select File--Import File and select VBA file. 7. The VBA is placed in the Modules folder. NOTE: Only import one instance of the IDAutomationVBA. If multiple IDAutomationVBA files (with the same file name) are in the modules folder, an "ambiguous name error" with #NAME will occur. 8. Select File--Close and Return to Microsoft Excel. Let's encode data for IMB. (1) Type some data into cell A2. (3)Enter the Cell reference and a close parenthesis. (5) Apply IDAutomationIMB or IDAutomationSIMB font to the encoded data. 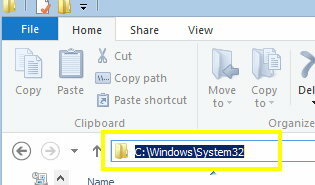 The solution is to download the IDAutomationNativeFontEncoder.dll (IDAutomationNativeFontEncoder64.dll) and copy it to the System32 directory. 1. Download the Native Windows DLL. 2. 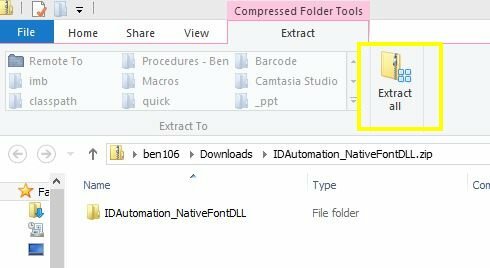 To extract the IDAutomation_NativeFontDLL.zip file, select Extract All. 3. 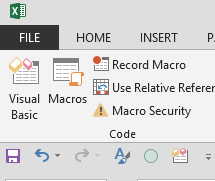 If Excel is running, exit out of Excel and any other MS Office Applications. 4. Double-click the Computer icon. 6. Return to the extracted file and left click on the IDAutomationNativeFontEncoder64.dll file. 7. On the keyboard, to copy the file, select Ctrl-C.
8. Open the Window and on the keyboard, and to paste the IDAutomationNativeFontEncoder64.dll file, select Ctrl-V.
Re-open Excel and encode the data as Intelligent Mail using the Barcode Add-In or IDAutomation VBA. » #Type! Error in MS Access using IDAutomation products.